Gen Xtinct: Sweep the leg, Johnny! Set your DVRs! 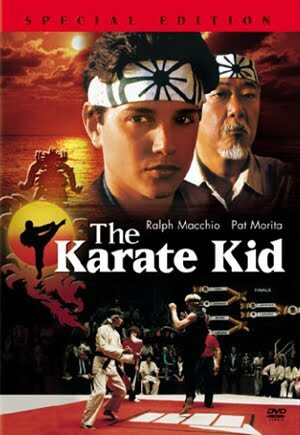 If you have the Encore network (and I have no idea if I do or do not), you can tune in to their "Karate Kid" marathon on Friday, the day the new movie comes out. They'll run the original film beginning at 5:50 pm Eastern, followed by all of the sequels. Not sure where I was, but not only did I not see the first film, I had no idea there were multiple sequels. Apparently the fourth one, "The Next Karate Kid," with future paralyzed boxer Hilary Swank as the latest kid. A girl! Horrors! Man, I bet Pat Morita bought a few houses with those paychecks. Now all four films are for sale for $30. Anyway, all the hype of the old films is to further promote the new film, opening Friday, and featuring Jaden "Hi, I'm Will Smith's kid" Smith in the Ralph Macchio role, and Jackie Chan (!) as the new Mr. Miyagi character. I'm trying to remember, but I do not think that we had even really heard of karate or martial arts before the first film. Now, everyone's little kid is a black belt.